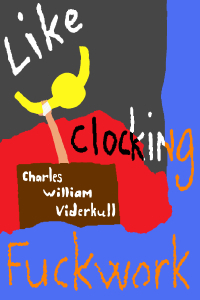 This weekend I’m making my novella Like Clocking Fuckwork free to download for readers of my blog. Follow this link to Smashwords and enter the Coupon Code ND34K for a free purchase. I just updated the site. The ‘Links’ section has been split up into two and expanded. There’s now one section called ‘Contact Me’ and one called ‘Published Works’. The latter has also been completed with short descriptions of my published works, which so far consists of the novella Like Clocking Fuckwork and the short-story A Fish goes for a Swim and ends up Drowning, first part of the Poison Flour series.